On board Hapag-Lloyd Cruises’ expedition ships – the HANSEATIC and the BREMEN – guests will become true pioneers and explore exciting destinations in the polar regions as well as exotic waters. The design of each ship – with a low draught of just 4.8 metres, maximum lengths of 122.8 metres (HANSEATIC) and 111.5 metres (BREMEN) and the highest ice class for passenger ships – allows them to travel to destinations previously inaccessible to a cruise ship. Including a new route in the schedule requires the most precise preparation, including nautical calculations. The best cruise timings have to be determined for each destination, as well as the duration of the proposed cruise and where landings can be planned with the on-board Zodiacs. For the product managers, the Hapag-Lloyd Cruises route planner and the captains of the BREMEN and the HANSEATIC, these premiere cruises - where they themselves will travel to a destination for the first time - prove very challenging to co-ordinate. A cruise premiere: In 2014, the HANSEATIC will be the first non-Russian passenger ship to traverse the Northeast Passage through the Russian Arctic. 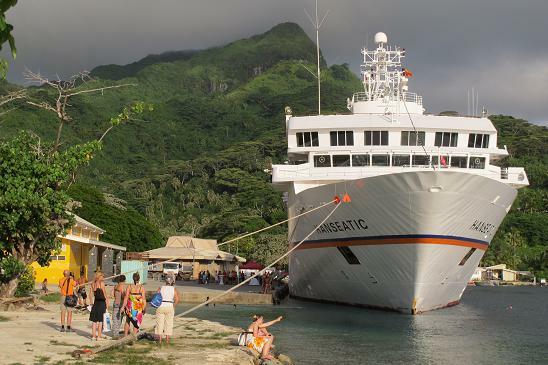 The two expedition ships, the 175 passenger HANSEATIC (5-stars*) and the 155 passenger BREMEN (4-stars plus*), set off on a course of discovery to explore the best kept secrets of nature and culture. Both expedition ships have been awarded the highest ice class for passenger ships (E4) and are suited for close-up expeditions into polar regions. A number of selected expedition cruises are offered as international voyages for English-speaking guests.